From London’s most iconic venues to a castle in Scotland and chic beach house in Malibu, these are the world’s most exclusive members clubs. 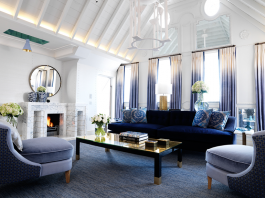 The second half of this year saw the launch of Ten Trinity Square Private Club, which sits alongside the recently opened Four Seasons at Ten Trinity Square hotel. Set within what is one of London’s great historic landmarks, the new members’ club combines its grand interiors with the gastronomy of three-Michelin-star chef Anne-Sophie Pic and the fine wine of Château Latour; the club houses the first Château Latour Discovery Room outside France, as well as an exclusive Château Latour dining room. A collection of palatial rooms provide ample space for relaxing, socializing, drinking and dining, with hand-carved walnut paneling, ornate ceilings, grand fireplaces and elaborate chandeliers throughout. As added incentive members have access to the luxury spa at the adjoining Four Seasons hotel too.